Balkan rock star Goran Bregovic is bringing his trademark Gypsy-fuelled frenzy to the Perth Concert Hall on 12 May with His Wedding & Funeral Band. Celebrating his 2018 album Three Letters From Sarajevo, inspired by the history and memories of his hometown of Sarajevo, Bosnia – exploring its different faiths, special identity, fusions and complex paradoxes. Goran describes himself simply as a contemporary composer. Why then does his “contemporary” sound different from music of other contemporary composers? Because Goran is from the Balkans. And in the Balkans “contemporary” is different. What does his orchestra for Weddings and Funerals composed of a gypsy brass band, traditional Bulgarian polyphonies, an electric guitar, traditional percussion, strings and Orthodox Church male singers, read on Bregovic’s score sheets? Echoes from Jewish and Gypsy weddings, chants from Orthodox and Catholic Church, Muslim invocations. His music comes from that terrible frontier where for centuries Catholics, Orthodox Christians and Muslims made war and lived together. Music that our soul recognises instinctively and the body greets with an irresistible urge to dance. Anyone who has experienced a concert by this musical virtuoso knows that they are triumphant affairs; expressing a love of music that is utterly infectious. 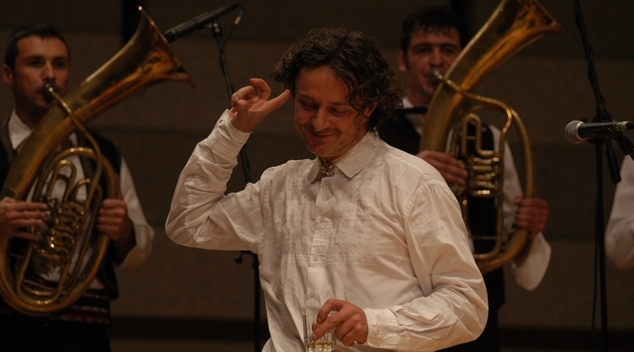 Goran Bregovic & his Wedding & Funeral Band will be at Perth Concert Hall on 12th May 2019.